That’s all. 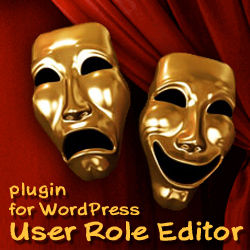 Login to your blog with administrator role and edit it with User Role Editor plugin help. Administrator role is still not available to users with all other roles and capabilities. This entry was posted on Saturday, January 21st, 2012 at 02:11	and is filed under ShinePHP plugins news, WordPress. You can follow any responses to this entry through the RSS 2.0 feed. You can skip to the end and leave a response. Pinging is currently not allowed.